One important photography skill to master is to learn how to photograph people. There are a lot of Digital Photography Tips web sites, for sure. There are a lot of articles on taking pictures of people and it can be confusing on what's the best thing to do. As I've mentioned elsewhere on this site, it's important to just take a second to think on what the photo is all about. Do you want the photo to be about your subject involved in an activity? Is it a photo to show off just the features of an individual's face? Even though this photo on the right has my 3 subjects facing away from me, it tells a story. I discussed the clothing choice with my client before we met at the lake. It's not an award winner. I wouldn't enter it in a photo contest; but, my client liked it because it was a little different than the average portrait pose. I placed the youngest sister in the middle to contrast her clothing as well as her size in contrast with her older siblings. They were watching a local fisherman in his boat. Notice how the direction of the sunlight from a 45 degree angle on the left creates a feeling of texture and depth to their clothing. Always remember to at pay attention to the existing light in outdoor photography. We'll start with some photo tips on photographing people that you don't know. Then I am going to give you some photography tips for how to photograph people that you do know. If you are taking pictures of people that you don't know, here are some tips on what you may want to do. If the person that I am photographing is the main subject, I always ask permission. Establishing good eye contact and having a friendly smile do wonders for getting permission. 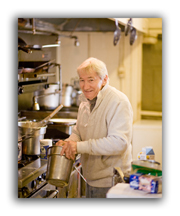 In this photo of the cook, I composed it to include the pots and pans behind him to make it a casual, environmental portrait. I held the camera close to my face, hesitated, then smiled. He returned the smile and I took the photograph. Be aware of cultural differences if you are traveling to a new area or another country when you photograph people. Did you know that the "thumbs up" sign that we use here in the United States could mean "up yours" in another country. In Thailand, Iraq and Iran the "thumbs up gesture is considered quite offensive. The "Okay," sign, made by connecting the thumb and forefinger into a circle and holding the other fingers straight, may signal the word okay in your country. That same gesture is offensive in parts of the south and middle of Europe. If you can tell your potential subject is uncomfortable, respect their privacy and leave them alone. Sometimes starting a simple conversation or giving a simple, sincere compliment can break the ice, before you ask permission. If I am taking pictures of people that I do know, I sometimes direct them gently like a professional photographer should. 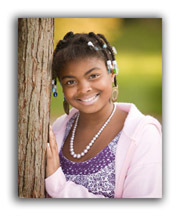 In this photo of my young model, I told her how to position her hand and how to tilt her head gently against the tree. I used a camera setting to give a shallow depth of field so that the background would be out of focus. The tree acts like a framing device. I used a 2 foot by 3 foot white cardboard held just below the camera's view that bounced the light back into the shadow areas. For outdoor portraits, I always try to find open shade. This allows my subject's eyes to be fully open and relaxed. Isn't this a beautiful portrait? Learning camera tips on how to photograph people will make your photography more enjoyable. You can learn more ways to take better digital pictures by getting photo tips from the other pages on this site. Bookmark this photography web site now so that you can find it again easily. 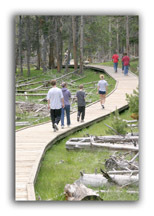 In this photo from a vacation in Yellowstone National Park, I positioned myself to get the "s" curve on the boardwalk. It leads the viewer's eye into the photograph. When the children view this photograph in the years to come , they will remember the winding path through the wilderness, the trees, the fallen logs and the amazing bison and other wildlife as they hiked. This photo is more of a candid story-telling pose. Here are a few posing tips on how to photograph people in a more structured family portrait style. Generally it's better to have smaller children posed in front of larger adults. The children become closer to the camera so they don't appear too small. Additionally if they are "blocking" part of their parents' bodies, the parents don't appear too large. This was a casual pose of this family, using the couch as a posing prop. Find more on posing family portraits. Knowing how to photograph people in their own home takes a bit of practice. Looking at colors, lighting, the number and size of the people that you are going to photograph all effect how you photographs will turn out. This two year old was full of energy and wanted to run around and explore my outdoor portrait park. I used the chair as a posing tool and a base to slow her down. 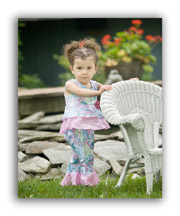 Having her in a standing position really showed off the dress her mom had brought for her to wear that day. I could have made it an even better photograph if I been able to chose a simpler background. If you would like additional information, there are a many printed books on this topic. I know. I have a small library of books on portrait photography as well as other "How to photograph...." a variety of subjects. Eyes and Portrait Photography Making portraits with more impact by having your subjects eyes follow you everywhere. The importance of eyes and how to photograph people with regard to the impact of perspective, photography lighting. and composition. Family Portrait Tips. 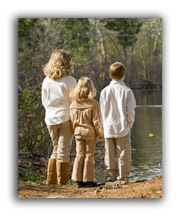 This article is good to read if you want to get a few general tips on outdoor family portrait photography as well as few sample poses you can copy. Newborn Portrait Photography. If you have an interest in information about newborn portrait photography, you might enjoy reading this. Portrait Poses. Would you like to get some photography tips on the posing of head and shoulder portraits? 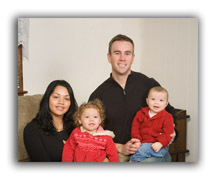 This article is on individual portrait poses> and also has some links to family portrait ideas. Photography Poses. If you are interested in how to photograph people in a group of 3, you may want to read this. I've had the fortune to be a family portrait photographer for over 25 years, so I've come up with 4 simple tips on how to pose a family portrait. Creative Family Portraits. Are you stuck for an idea on getting creative for a family portrait? Sometimes you need to look elsewhere to find some inspiration for something different. Pictures of the Elderly. Watching people walk by is an activity that many enjoy. Looking at photos of people gives you the opportunity to study a moment in time. Photographs capture the individual characteristics of their faces. This article has 6 unique head shots of the elderly and my give you some incites into how to photograph people. Photos of old people. These photos of old people show how lighting plays an important role in your photos of old people and also how rewarding photography of elderly people can be. There are more digital photography tips on this site, such as: composition tips, how to avoid common photo mistakes, photo exposure and digital camera settings. It's my intention for you to have fun improving your photography in general and specifically enjoy knowing how to photograph people too.